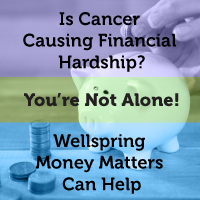 Wellspring offers many core support programs in an online format. This format lets you participate in programs and to network and share, at your leisure, or from the comfort of your own home. Our online programs are professionally facilitated and are free to join. Many program materials are also available online to help you practice at home. To find out about current online program opportunities, simply visit our online centre.